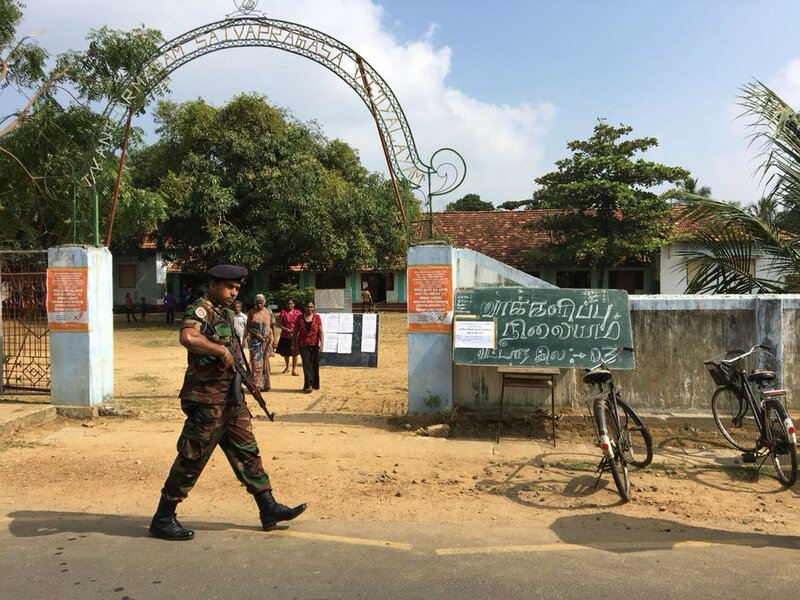 Tamil voters in the North-East last week, as Sri Lankan security forces look on. Sri Lanka’s ruling parties and the Tamil National Alliance (TNA) have been “offering vacuous rhetoric on reconciliation instead of addressing the roots of the country’s political conflict”, writes J S Tissainayagam in the Asian Correspondent, leading to Sinhalese and Tamil voters to “distrust them as political actors”. “The voters conveyed just this at the polls” during last week’s local government elections, he continued. If there was sincerity to establish these institutions, or its absence at least the annulling of the draconian PTA provisions that restricts protections for free speech, there could have been a public discourse on why accountability for past atrocities was needed. The TNA’s 2015 election manifesto also emphasised a new constitution based on federal principles. However, although both the UNP and UPFA expressly rejected any idea of a new constitution on federal principles, the TNA not only continued to promise a federal constitution, but has asked Tamils to support the party so it could work with the National Unity Government for a federal constitution to further the aims of reconciliation. The reality seems different. Although the new constitution is nowhere near completion, interim documents put out by Constitutional Council do not appear to answer Tamil aspirations for power-sharing through a federal constitution. It has led to allegations by the Tamil public of intentional deception by the TNA. Although it did not suffer a rout, the election results were setback to TNA’s popularity and therefore dented its stature. The Tamil voter realised that the TNA’s brand of politics was one of appeasement. Voters did not expect the TNA to work miracles but tell them the truth; not point to the dawn of reconciliation around the corner, when the political and military reality in their daily lives projected another reality. Preparing for national elections in two years, the Sinhala ruling establishment will probably try accommodating a compromise between the demands of Rajapaksa and the more pro-West constituents of the National Unity Government, at the expense of reconciliation or power-sharing with the Tamils. For the TNA and other Tamil parties, the path ahead is listening to the needs and articulating support to their constituents, as the Tamils resist rising militaristic Sinhala nationalism.